By Dennis W. Viau; modified from a recipe in a Moroccan cookbook. 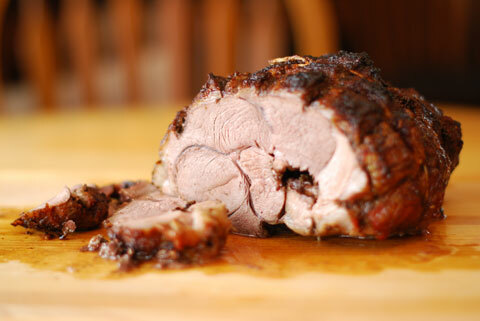 This roasted leg of lamb has an exotic flavor, being seasoned primarily with cumin. The flavor is lighter than beef chili, but the spice is evident. Lamb has a bold flavor anyway; so adding cumin and garlic, along with other spices, complements the meat well. Pierce the leg all over with a small knife or cut shallow slits across the leg in a checkerboard pattern, just cutting through the fatty rind to the meat. Combine butter, garlic, cumin, coriander, paprika, and ½ teaspoon salt to make a paste. Rub the meat well with the spice mixture. If using a boneless leg of lamb, open the leg and rub a small amount of the spice on the inside as well; then tie the leg into a roast again. Heat the oven to 425°F (220°C) with a rack in the upper portion, but leaving enough room for the roast. Place the leg, rind side up, in a deep roasting pan and roast on the upper rack of the oven for 10 minutes. Baste with the juices, if any, and remove the upper rack (or move to a center position). Reduce the oven to 325°F (160°C) and place the roast on the center rack. Roast for 3¼ hours, basting every 20 to 30 minutes. I find that this roast does not yield juices for basting; so I add about ¼ to ½ cup of white wine initially, then add more periodically, as needed, to have juices in the bottom of the roasting pan. For a really tender leg of lamb, reduce the oven to 250°F (120/130°C) and bake for 7 to 8 hours. The meat will be tender enough to separate with your fingers, which is one traditional way of eating it. When done, remove from the oven and let rest 15 minutes before carving. Carve at the table. Combine the garnish ingredients and place on the table for guests to add to their meat, if desired.